A relaxing day by the sea will be more perfect with a visit to the Northern Bay Sands Park set up on the shores of the Conception Bay. The virgin beach offering picturesque landscapes of the Newfoundland Island is one of the most popular camping sites in the area. With your kids, you can wade in the freshwater pool that juts out into the Atlantic Ocean. You can enjoy playing beach volleyball or tetherball under the sun or enjoy the fresh cut and fried potatoes with fish and chips made of cod fillets. The large campsites are partially shaded and have hot showers, picnic shelters and playground. After beach hopping in Northern Bay Sands Park, you can take a hike along the trails that pass through the rustic landscapes and by the sea. A great little out of the way beach and camping park. Highly recommended for anyone looking for a bit of an adventure in Newfoundland with a real gem waiting for you at the end of your trip. The beach is beautiful and kept clean. The ocean is available for swimming for those hardy enough or there is a more comfortable freshwater swimming hole as well. 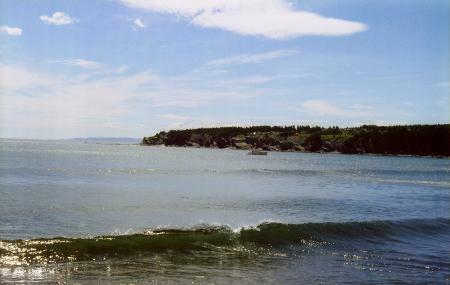 Caplin also land on the beach and you can swim with schools if you are there at the right time. Northern Bay Sand is one of the awesome beaches in NL. A small river joins with the Atlantic Ocean here and this river was amazing. Although ocean was cold (as around 10 C), the river water was much warmer and enjoyable. We nearly 15 people of different families had fun here. We swam in the river, enjoyed potluck lunch, and even played volleyball on the beach. It is highly recommended for anyone on a sunny day! Beautiful clean beach. Best sand around. I grew up on this beach and I still love it! It is a must to visit this beach if you are in the area.